Five years in the making, the long-awaited Coney documentary Zipper premiered Saturday at DOC NYC and screens again today at 3pm and 9:30pm. The theater is the IFC Center on 6th Avenue at West 3rd Street in Manhattan. The first time we met director Amy Nicholson was in Coney Island on September 9, 2007, the last day of Astroland, which later got a one-year reprieve from landlord Thor Equities. As Amy and cinematographer Jerry Risius loaded equipment into a car, she explained they were making a film featuring the Zipper. The ride had also been evicted by Thor and eventually they would film it being driven away. “A small-time ride operator and his beloved carnival contraption become casualties in the battle over the future of Coney Island” is the film’s capsule description. 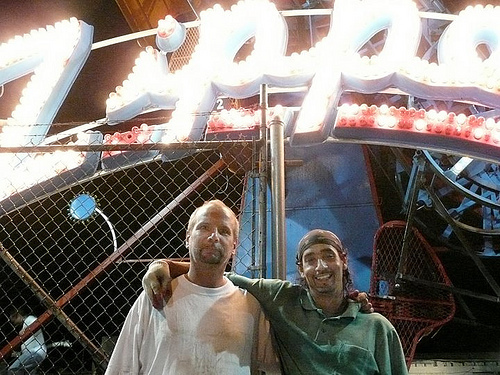 Eddie Miranda, who worked on Coney Island’s rides since he was a boy, owned and operated the Zipper and Spider for a decade. In the doc, Eddie’s Zipper represents all of the mom-and-pops who were displaced by the real estate speculation that was set off by the Bloomberg administration’s plan to rezone Coney Island. The names of the businesses, including Batting Cage and Go Kart City, Shoot Out the Star, Shoot the Freak and Steve’s Grill House, are memorialized on the screen in the final credits. Eddie and his Zipper crew–Don, Joe, Larry and Jerry–are a likeable bunch of guys who cut up jackpots about how far back they go in Coney and with each other. Watching them disassemble the Zipper is heartbreaking, all the more so because in the film, this scene happens as the City Council votes “Aye” on the rezoning that will shrink the amusement zone and allow retail and high rises on the south side Surf Avenue. It’s poetic license because the vote was held in July 2009, two years after the Zipper had left Coney Island. But it is exactly right, because the land remained vacant all that time. The Zipper site is presently part of Wonder Wheel Way and Scream Zone, which along with Luna Park was built after the City ended the stand-off with Joe Sitt shown in the film and bought 6.9 acres of his land for $95.6 million in November 2009. “It’s a vision offering major new opportunities for retailing and thousands of new housing units,” says Mayor Bloomberg at the City Hall press conference announcing the land deal and the City’s own redevelopment plan for Coney Island. The film does a great job of making the complex details of the Coney Island rezoning easy to comprehend with snappy graphics, newspaper headlines (“Rezonie Baloney” is a fave), and TV clips of reporters covering the Coney beat. Interviews with Amanda Burden, Director of the New York City Department of City Planning, Coney Island’s City Councilman Domenic Recchia Jr., and Thor Equities CEO Joe Sitt speak louder than words. One of the most effectively edited sequences has the trio taking turns saying what kinds of retail the new zoning would allow them to bring to Coney Island. Suggestions range from entertainment franchises like Ripley’s Believe It Or Not, Howie’s Game Shack, and Build-A-Bear Workshop (Sitt) to Williams-Sonoma (Recchia), Gap and Duane Reade (Burden). As we said in a previous post: Ugh. Sounds like Any Vacation Spot, USA. Cut to Zipper crew members Joe and Don, who look stunned. “They could care less about the amusement business, about Zippers,” says Don. But the film makes viewers care about Zippers. It takes us to Chance Rides factory in Wichita, where the classic ride was invented in 1968 and the company’s elderly founder Harold Chance is interviewed. We learn there were only 224 built and Coney Island’s Zipper is number 34. Seeing the Zipper for the first time since it left Coney Island for a seaside carnival in Honduras, tears welled up. They have our Zipper! At the same time, we felt happy to see it still alive and thrilling riders. The irony is that the three members of the Zipper crew who managed to find another place to work in Coney Island are about to lose their jobs again. On the weekend of Zipper’s premiere, they were busy dismantling the rides in McCullough’s Kiddie Park since it has closed forever after 50 years. The family that owns the park wasn’t able to come to an agreement on extending the lease with property owner Thor Equities. 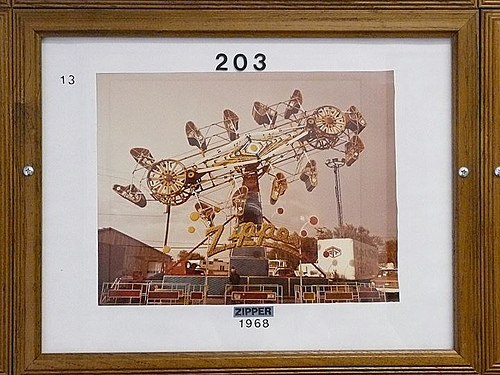 In one of the photographs above, it states The Zipper was being dismantled after 10 years. I remember The Zipper from my teenage years in the 1970’s. That would make it at least 40 years in place! I remember in the Blackout of 1977, that and the Paratrooper were the only two rides lit up, since they both ran on gas engines! All of the captions on the photos – including the one “It was hard to take the Zipper apart because it hadn’t been disassembled since it was parked on that spot – almost 10 years” came with the photos from Zipper’s Facebook page. When I saw Eddie Miranda at the screening, I asked him how long he’d owned the Zipper and he said 10 years. Lee, happened to talk with Don (who is in the film) and he says that in the 1970’s there was a Zipper at McCullough’s park. It may be the one you remember!